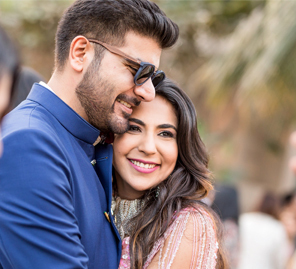 Sakshi and Varun’s wedding at Jumeirah at Etihad Towers in Abu Dhabi was a lavish affair which was followed by a glamorous Mumbai reception. 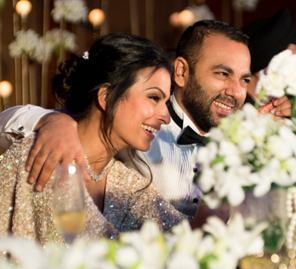 Sakshi and Varun planned their lavish wedding celebrations at the luxurious Jumeirah at Etihad Towers in Abu Dhabi with exquisite decor and attention to detail. Here, we share details from their love story and highlights from the nuptials planned by Krayonz Entertainment and beautifully captured by WeddingSutra Favorite - The Lightsmiths. The festivities began with a Cocktail Party which was hosted at the ITC Grand Maratha in Mumbai. With a theme of a 'Glamorous Night,' the venue with its strings of party lights and beautiful decor cast a cheerful and warm glow. Everyone looked amazing, but all eyes were on the couple as they were dressed to impress! The pool party was a splash of colors with vibrant decor elements. This couple’s love for all things quirky was recreated at this event. There were carnival dancers, performers, good music, dancing and the highlight of the day was the guests jumping into the pool! 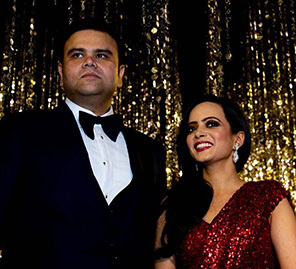 The sangeet night was an entertaining evening with dance performances, songs, and revelry. The bespoke decor looked perfect with a color palette of black, white and gold. While the bride twirled prettily in a yellow Shantanu and Nikhil creation, the handsome groom complemented her in his blue outfit. While the groom’s side of the family hosted a traditional haldi ceremony, the bride's side organized a 'Chura' (bridal bangles presentation ceremony) function. These were intimate functions with close family and friends in attendance which was later followed by lunch. The sun-downer wedding ceremony was filled with unforgettable experiences for the couple. The beautiful beach wedding witnessed the sea and sky forming an immaculate backdrop. In the evening, the couple took their vows in the presence of their family and friends. 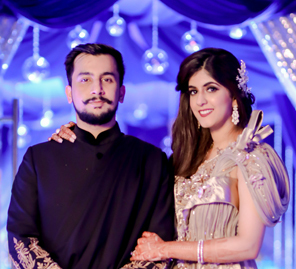 The bride was a vision in her ethereal lehenga and beautiful diamond jewellery while the groom looked every bit of a royal in a blue and white sherwani. The serene wedding ceremony was followed by a sit-down dinner. The couple wanted elegance for this evening, so they stuck to shades of red and orange, gold accents and flower arrangements as table centerpieces. There were performers that enthralled the guests and some good music for the couple and their loved ones as they all danced the night away. Also spotted at this sit-down dinner were popular Bollywood actors such as Salman Khan, Jacquelin Fernandez and Bobby Deol that joined the couple to wish them a blissful married life! The reception was hosted at Four Season Hotel Mumbai. With all the traditional ceremonies coming to an end, everyone let their hair down and partied until late at night. This was truly a royal affair with red and white decor. A row of chandeliers led to the entrance where a beautiful entry way was created. Inside the venue, fresh florals were arranged and the space was bathed in party lights.